Irwin Weiner ASID - Design2Share readers are in for a treat today because brilliant New York City interior designer Alla Akimova of ARCHIVES id is sharing some of her most fun art-filled interiors with us. Here's how she describes the vibrant entry hallway (top photo) from an apartment she designed on West 54th Street. The warmth of the first project is turned on its head in Alla's second project (above), a 5th Avenue apartment. (The beautiful whites could likely be taking a cue from Alla's native Siberia.) 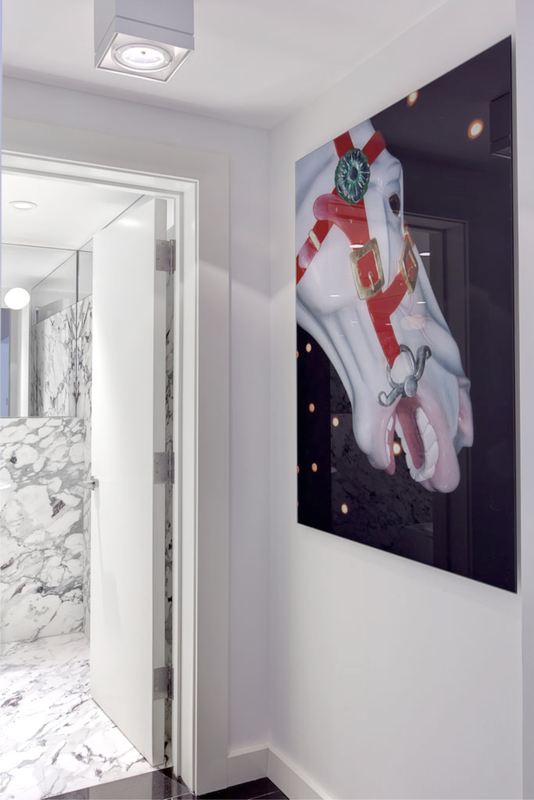 The crisp whites of marble and subtle tonal differences in the white walls and moldings play off the contrast of an expansive black floor, then playfully encapsulated in a startling close-up photograph of a carousel horse. Alla told us more about this project. Click here to see Alla Akimova's D2S Photo Essay on her stunning work in Holiday House 2012.